She accused Rohingya militants of being "harbingers of terror and violence" in a Facebook video. Myanmar beauty queen Shwe Eain Si says she was stripped of her title for speaking out against Rohingya militants. Myanmar's Rohingya Muslims are a minority group that are largely shunned by Myanmar's mostly Buddhist population. The country doesn't consider them citizens, and rights groups say the Rohingya are often targets of police brutality. The beauty queen's video featured a Rohingya militant group known as the Arakan Rohingya Salvation Army, or ARSA, which was reportedly behind the deaths of more than 20 police and security forces. The video doesn't mention the reports that Myanmar's military allegedly killed hundreds of civilians in retaliation. In the graphic video posted on Facebook, Shwe Eain Si called ARSA "harbingers of terror and violence." 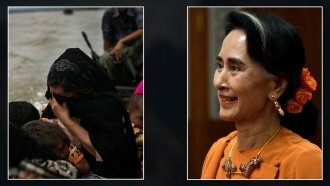 She went on to claim that reports of Rohingya oppression are part of a fabricated media campaign. She now claims she lost her Miss Grand Myanmar title over the video. The company that rescinded the award denied this, saying the decision was made before she posted the video. More than 500,000 Rohingya people have fled Myanmar to escape the violence and now reside in makeshift camps in Bangladesh. The United Nations has also called out the Burmese government for what it said looked like "a textbook example of ethnic cleansing." But the former Miss Grand Myanmar isn't alone in her view of the Rohingya crisis. Myanmar's government claims ARSA is a terrorist organization and the government's actions are a part of a global war on terror. And Shwe Eain Si received a wave of online support for her stance after her crown was taken.